The development of offshore wind generation has been progressing at a rapid pace in recent years. 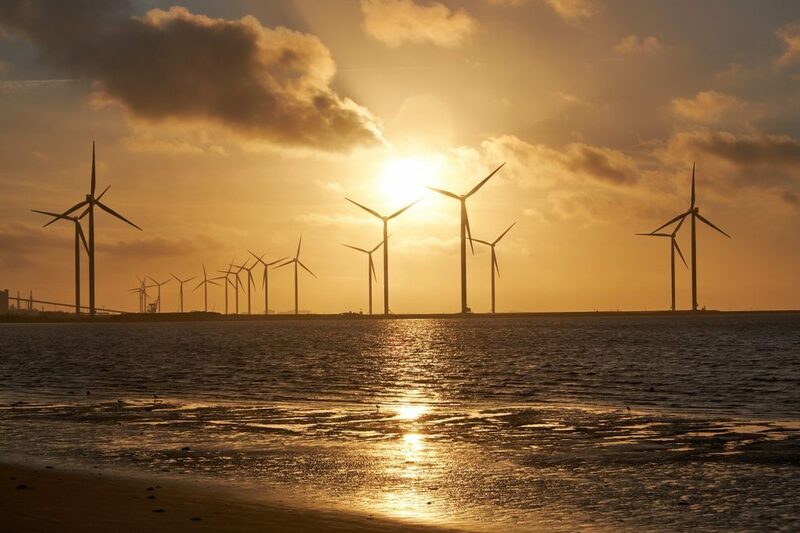 The latest data and report published by the Global Wind Energy Council (GWEC) reveals that the cumulative total of installed offshore wind capacity worldwide at the end of 2018 came to 23GW, showing a growth of 9% from the end of 2017. Wind power already has a long history of being an effective source of green energy for producing electricity, and the scale of the global wind market is anticipated to keep growing steadily in the future. According to GWEC, the cumulative total of installed wind capacity worldwide came to 591GW in 2018. The annually installed (or newly added) wind capacity worldwide in 2018 totaled 51.3GW, a decrease of 3.6% compared with the capacity that was installed in 2017. The newly added onshore wind capacity in 2018 fell by 3.9% from the prior year to 46.8GW. On the other hand, the newly added offshore wind capacity in 2018 increased slightly by 0.5% from the prior year to 4.49GW. The expansion of the offshore wind market correlates to the increasing number of offshore projects in the pipeline. China is among the fastest growing offshore wind markets in the world. The data from GWEC show that China installed more offshore wind capacity than any other countries during 2018, totaling 1.8GW. The UK was second in the ranking of offshore wind markets by newly added capacity for 2018 with 1.3GW, while Germany took third place with 900MW. These figures, to some extent, confirm a forecast presented in an earlier report published by US-based FTI Consulting. The report contends that while the UK is currently the world’s largest offshore wind market by cumulative capacity, China is expected to surpass it by 2021. Based on the firm’s projection, China’s cumulative capacity for offshore wind will hit 10.9GW in 2021. The cumulative capacity of the UK will be slightly smaller at that time, growing to 10.4GW. GWEC also forecasts that the total annual installations of offshore wind generation in Asia will rise to the 5GW level if the region’s offshore wind projects that are under development are completed as scheduled. On the other hand, the offshore market of the US has seen stagnating growth. GWEC forecasts that the cumulative capacity of the US offshore wind market will reach just 1GW in 2022-2023. Ben Blackwell, CEO of GWEC, said that the outlook of the Asian offshore wind market will remain quite positive due to the entry of European wind developers and government mandates on renewable energies. GWEC furthermore believes that this regional market will experience rapid growth over the next decade. Offshore wind is among the few sources of green energy that the market has been bullish about in the recent years. The installation of offshore wind turbines offer two major benefits. First, offshore wind turbines can generate much more electricity when compared with their onshore counterparts. Second, their deployment is not restricted by land availability. Operating in open waters without facing any natural barriers or manmade structures, offshore wind turbines are able to capture steadier and stronger wind. The data on the global wind industry compiled by Bloomberg New Energy Finance (BNEF) in 2017 show that wind turbines had attained an average generation capacity of 9MW in 2017. The maximum hub height of turbines also reached 160m in the same year. BNEF in 2017 also forecasted that wind turbines will be able to achieve 13-15MW in 2025, and that their hub heights may exceed 200m by that time. If the forecast is accurate, then the total height of a turbine, including the addition of the blade, could be more than 300m by 2025. Turbines of such dimensions will significantly raise the output of offshore wind farms in the future. Amory Lovins, founder of the non-profit the Rocky Mountain Institute, claimed that power grids in the East Coast of the US can fully be supplied by offshore wind generation. Researchers at Carnegie Mellon University in the US also reported that offshore wind farms generate much more power in a given area than land-based wind farms, such as the ones in Kansas. According their analysis, the average output density of offshore wind farms is around 6W/m2. The average output density of land-based wind farms, by contrast, is only around 1.5W/m2. R&D in offshore wind has yet to approach full maturity, and there are still many aspects related to turbine design and installation that requires further exploration. Take foundations for example. Currently, most offshore wind projects adopt turbines that are mounted on fixed foundations planted on the seabed. While there are different types of fixed foundations that deals with specific terrains and environmental conditions, their installations are limited to sites that are no deeper than 60m below water. There are also other factors that restrict the construction of fixed offshore wind turbines to particular areas. In order to expand their operations, offshore wind developers are now gradually moving to deep waters to set up their turbines and are developing technologies that will help them do so. Some developers have already demonstrated floating wind turbines that can operate beyond the depth limitation for fixed turbines. The world’s first commercial wind farm using floating turbines was built off the coast of Scotland in 2017 and entered operation in 2018. Each turbine in the wind farm is mounted on a floating platform that is 90m in height. The platform in turn is moored to three suction piles that are implanted in the seabed, thereby anchoring the turbine in waters exceeding 100m in depth. The floating wind farm in Scotland is reported to have a generation of capacity 30MW. The market acceptance of floating wind turbines is expected to increase in the future due to advancements in related technologies. Overcoming the limitations that prevent the deployment of turbines in deep waters will not only boost the growth momentum of offshore wind generation but also become a major breakthrough trend in the renewable energy sector.